The miracle of Christmas surrounds an event that is almost impossible for the human mind to comprehend—that God came to earth, born in a manger, to save mankind. Christmas has become such a monumental event that it’s almost too big to define. There are parties, programs, concerts, extravagant gifts, and lighted drive-through neighborhood displays with thousands of lights. We try to simplify the phenomenon the season commemorates by merely saying “It’s all about baby Jesus.” Then we turn from the manger, thinking Ah, now I understand!—and go on with our festivities. But no. We don’t understand. It’s humanly impossible to understand what happened 2,000 years ago. Unless you understand who “Little Baby Jesus” was and what he was up to before the day of his birth into humanity, you’ll never understand the angels’ glorious celebration. It’s when God entered our little corner of the universe in an amazing way. The Bible explains what Jesus did this way: “Christ Jesus…although He existed in the form of God…made himself nothing…being made in the likeness of men (Philippians 2:5-7). “Made himself nothing” actually means “emptied.” Like a leader of a wealthy country leaving all his position and authority and moving to an impoverished third-world country as a homeless man! In doing that he would be “emptying” himself. But that everyday example of self-emptying transformation doesn’t even come close to what Christ did. Jesus didn’t just look like God, he was always God. Before becoming a tiny unborn baby within a young virgin, Jesus Christ has always been God! The infant Messiah was a Being of another kind and place who took on a new nature—a human one—yet without changing who he is innately and eternally. The first words of John’s gospel in the Bible tell us that Jesus was one with the Father in the beginning of time, that “all things were made through Him, and without him was not any thing made that was made” (John 1:3). We know through current scientific data that the visible universe contains an estimated 100 billion galaxies, each with a diameter millions of trillions of miles wide, and each galaxy contains hundreds of billions of stars! It was this Creator who emptied himself of all that glory and power so that he might enter a tiny planet in the Milky Way, in an insignificant backwater part of the Middle East—coming into the world just like we did, as a vulnerable baby. He who holds all things together by his power allowed himself to be so helpless that his very existence depended upon a human being. Though Jesus came to us in the mantle of weakness, only infinite power could work this miracle. Our human bodies contain an estimated 100 trillion complex cells. We are marvels of the most complex kind of engineering. Just imagine trying to humble yourself into becoming the single microscopic cell you began life as. What kind of knowledge, creativity, and power did it take for the eternal Creator to become an infant, without becoming one less bit God than he was before? How could he "who fills all in all" (Ephesians 1:23) confine himself to a human womb and yet still be able to fill everything? There is power in his humility. Was this act any less of a miracle than when he made everything out of nothing? It may not be hard for some to believe that our Creator loved us and wanted us closer to him. But the truth is that, since the rebellion of the first man and woman, the human race has always wanted to live independently from God. In fact, that desire to do things our own way and to disregard our Creator’s guidance has created a significant chasm between God and us. God calls that disobedience “sin.” His book, the Bible, warns that “Your iniquities have made a separation between you and your God” (Isaiah 59:2). “He came to his own, and his own people did not receive him. But to all who did receive him, who believed in his name, he gave the right to become children of God” (John 1:11-12). What should be an absolute wonder to us all is the lengths to which he was willing to go to bridge that chasm so he could be with us. The manger scene is a monument to the love of our God and his commitment to bringing his creation back to himself. The ultimate shock is that He did it all in order to die in place of the human beings he had created! 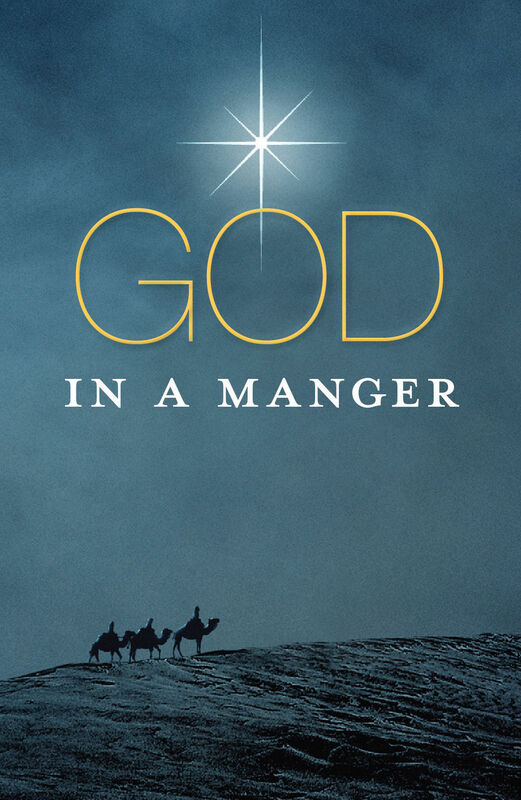 Christ’s birth was the ultimate act of creation—a true God-man was miraculously born. But his death 33 years later was the ultimate sacrifice, for the Son of God to lay down his life to pay the penalty for the sins of mankind! It was the only way we could ever be forgiven and overcome sin’s rule over us. “He himself bore our sins in his body on the tree, that we might die to sin and live to righteousness. By his wounds you have been healed.” (1 Peter 2:24). “For God so loved the world, that he gave his only Son [to be born and to die for us], that whoever believes in him should not perish but have eternal life. For God did not send his Son into the world to condemn the world, but in order that the world might be saved through him” (John 3:16-17). So on Christmas, as you contemplate the tiny baby in the center of the Nativity scene, consider the heights from which Christ came and the breadth of the power he wielded from before all time. Consider that no one in all of history has ever given up more or gone to such lengths for the sake of love.